Fill in the gaps in the Photos app. 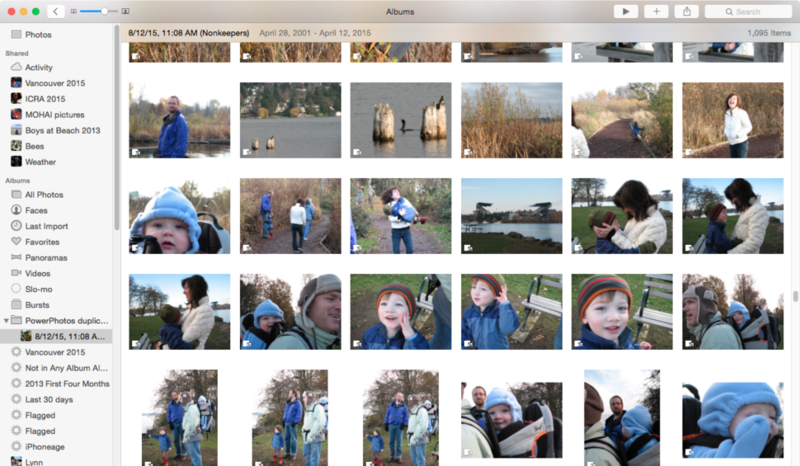 While Photos is streamlined and zippy compared to iPhoto, its stripped-down approach can be confusing. PowerPhotos takes some of the shock out of Photos for OS X by helping bridge the gap between old and new. Fat Cat Software’s app offers assistance in migrating iPhoto libraries, managing multiple Photos libraries, and a different way of viewing images and videos. It’s more flexible, to be sure. When launched, PowerPhotos shows—under an Operations listing—Migrate iPhoto Libraries, which can also be selected later from the File menu. This lists all iPhoto libraries that it can find via Spotlight; you can add others manually. The migrate operation lets you manage creating Photos-compatible libraries without babysitting the Photos app, and shows progress and errors. It can also migrate several libraries from the same interface instead of requiring multiple iterations of quitting and launching Photos with the right key held down. PowerPhotos doesn’t merge Photos, iPhoto, or Aperture libraries. Its predecessor, iPhoto Library Manager can merge iPhoto and Aperture ones. PowerPhotos' Find Duplicates feature creates an album with all the images marked as duplicates that you accepted. 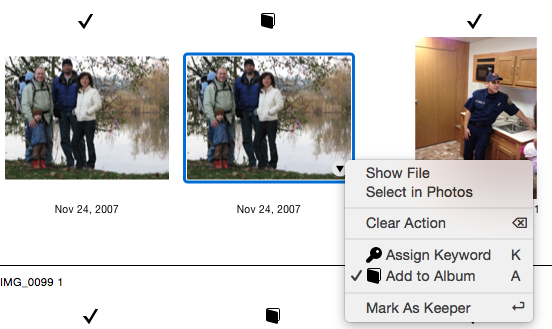 Once you have Photos libraries migrated or created, you can use PowerPhotos’ duplicates feature (File > Find Duplicates). I apparently have 43,169 photos in my master Photos library, and I hadn’t spotted many duplicates in my perusal. PowerPhotos found over 1000! If you have multiple Photos libraries, you can scan across them, too. An image deemed to be a duplicate that should be discarded can be swapped to be the one kept, among other operations. The app gives you several choices for deciding how to let it identify duplicates, including excluding hidden photos, images marked with “duplicate” in the keyword field, and photos that it’s already placed in a special album. Comparisons can be based on the content of an image (Exact Match), which looks for byte-for-byte identical versions of either the original image or any modified version you’ve stored. Or, you can opt for filename and date, which includes minor variations in filenames commonly used with duplicates. Even with my huge library and using exact matches, it only took about 20 minutes on a 2014 Mac mini while I continued to work on tasks in other apps. Once the pass is complete, you can review pairs or multiples of images and make sure your matches are correct. If not, you can switch which image in a set you want to be the “keeper,” or discard the match entirely, among other options. The Find Duplicates feature allows exact image matching or matching against a combination of file name and date. When you’re done reviewing and click Apply, instead of deleting the files or moving them to the trash, the images are placed by default into a special duplicates album, which you can then review in Photos to dump into the trash. 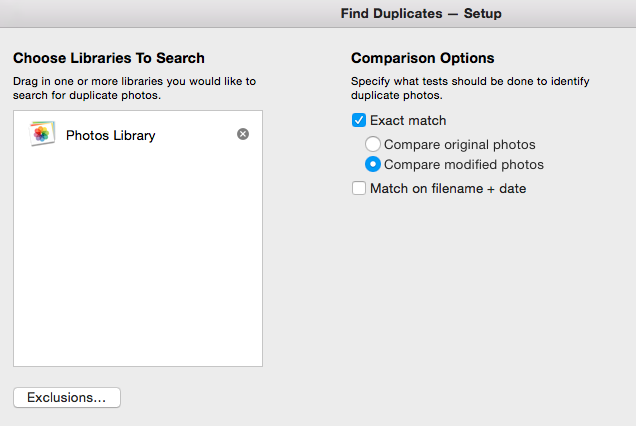 While you might use Find Duplicates once or rarely, the ability to easily review and switch among multiple Photos library is a must-have feature for many users, based on the email we’ve received at Macworld. Some iPhoto users set up multiple libraries, one per year, or with other divisions that they want to maintain and have access to. PowerPhotos can’t overcome iCloud Photo Library’s limit: one Photos library is a master to which iCloud syncs. 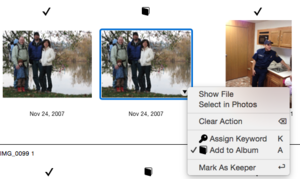 With a Photos library selected, PowerPhotos lets you select Moments as items in its navigational column. Albums and Smart Albums are also shown. But where it shines compared to Photos is with its list view and in an middle ground for search between Photos very basic option and Smart Albums. 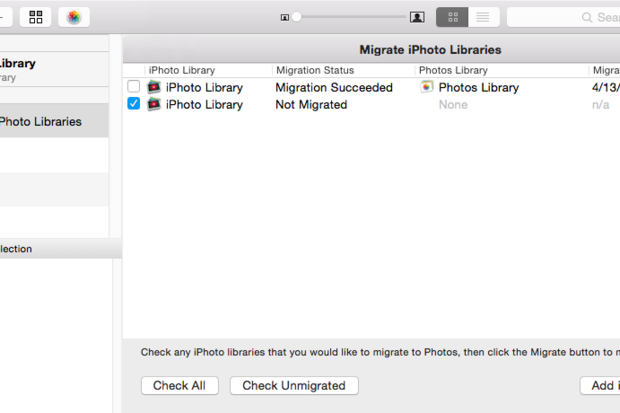 Migrating libraries from iPhoto and Aperture to Photos can be managed with more élan within PowerPhotos. Click the list icon at upper right, and PowerPhotos shows a thumbnail that can be sized from tiny to enormous, and then a host of associated data, allowing easier scanning through and sorting. By default, it just shows a few items, like Title and Date. But pop into the View > Show Columns items list, and you can add Description, Place, Faces, Size, and more. This works well in association with its find feature. Type in a word or more, and PowerPhotos searches across all of an image’s file data and metadata. But then you can opt to broaden to search across all libraries the app is managing, and narrow to match that text only across Title, Filename, Keywords, Faces, Place, Description, and Moment. While you can achieve this with a single library using Smart Albums in Photos, it’s not interactive nor can it provide the compact density of a detailed list. The list view in PowerPhotos provides a lot of detail in a compact format for quick scanning. PowerPhotos is an extremely useful addition as an enhancement for any Photos user trying to perform tasks that fall outside of Photos restricted purview. It’s also worth the price for one-time use if you’re just trying to move iPhoto libraries over and remove duplicates after doing so across all of them. Fat Cat offers PowerPhotos for $20 or as a bundle with iPhoto Library Manager for $30. Owners of iPhoto Library Manager 4 get PowerPhotos at no cost. Fat Cat may add a Photos library merge later, but it’s not guaranteed as a future feature. PowerPhotos is an extremely useful addition as an enhancement for any Photos user trying to perform tasks that fall outside of Photos restricted purview.